Sokoban for Windows - Cool version of this classical strategy game. More than 23000 levels. Cool version of this classical strategy game. The object of the game is to push boxes into their correct position in a crowded warehouse with a minimal number of pushes and moves. It sounds easy, but wait till you have tried it. More than 23000 levels.Play in several tabs. Live Update for new versions and levels. 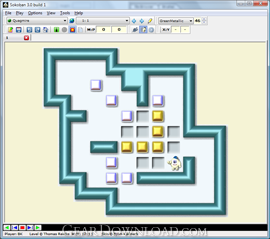 Create your own levels with the level editor. More than 35 skins available. Live scoring. This download (Sokoban.msi) was tested thoroughly and was found 100% clean. Click "Report Spyware" link on the top if you found this software contains any form of malware, including but not limited to: spyware, viruses, trojans and backdoors.